Hunt the Wren - Island-wide! 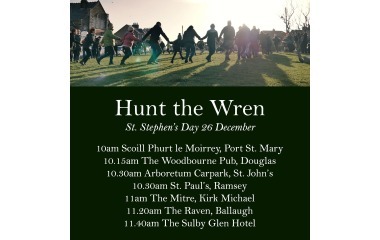 Join revellers around the Isle of Man to celebrate the old tradition of Hunt the Wren through song and dance - no small birds harmed these days, thankfully! Musicians, singers and dancers of all ages and abilities welcome! RAMSEY - meet outside St Paul's Church at 10.30am. ST JOHNS - meet at 10.30am in the Arboretum car park. PORT ST MARY - meet at 10am in the Scoill Phurt-le-Moirrey car park. KIRK MICHAEL - meet at 11am outside the Mitre pub, then onto The Raven Pub in BALLAUGH 11.20am and SULBY Glen Pub at 11.40am. Singing and dancing and hunting the wren must be over by 12 noon to avoid bad luck! Then everyone down to ST JOHNS for the annual Cammag match! FIND OUT MORE about the Hunt the Wren tradition in the Isle of Man.